Mount Adams early in 1958, viewed from the foothills above Glenwood. Photograph by Walt Danielson. 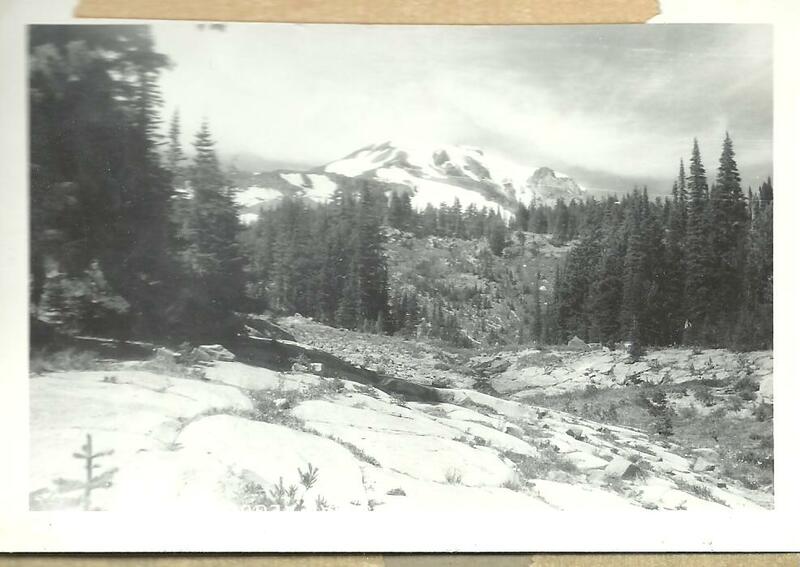 I climbed Mount Adams for the first time in 1957, when I was a year old. I had help. My parents corralled all six youngsters and, in caravan with my grandparents, they drove the axle-shattering dirt roads to Bird Creek Meadows, just below snowline on the shoulders of the great peak. As proof of this visit, I offer the following pose, the portrait of an outdoors man as a very young man. 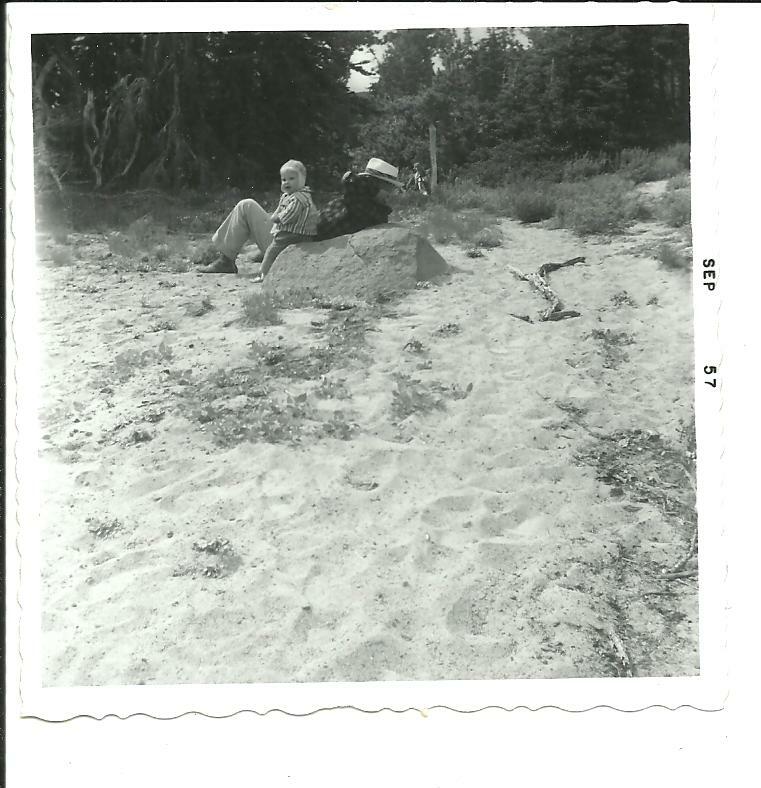 My father and I rest on a rock on a sandy bank at Bird Creek Meadows in 1957, when I was a year old. This article is full of mistaken assumptions, a lesson waiting for recovery beneath the ice of ignorance. For instance, I always assumed that Stevens Pass was named by good old George McClellan, as if he took time out from his trout fishing ever to really explore ways to get across the Cascades when Washington Territory’s first governor (and railroad route scout), Isaac Stevens, ordered him into them hills to locate a pass for a railroad to use. (By the way, if you’re interested in what the fishing was like around Yakima in the 1850s, McClellan’s journal will tell you. McClellan never got far. He glanced at the frowning cliffs above the Tieton River and turned around, reporting that a pass didn’t exist.) I started the article by claiming that a plaque memorialized the Reverend James M. Thomson in the basement Scout Room of St. James Presbyterian Church in Bellingham, Washington. But in a fact checking expedition this weekend, I discovered that I was mistaken: no such plaque exists. Now, I wonder why. 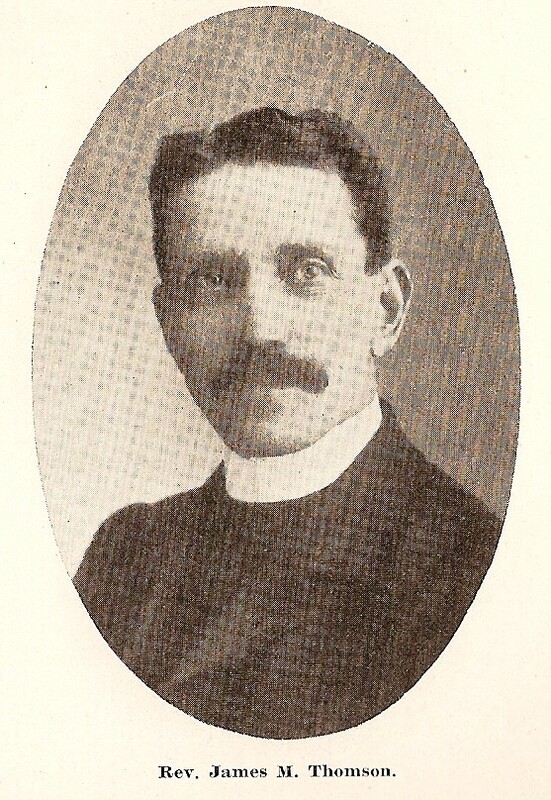 A grainy portrait of Reverend James M. Thomson was found in the 1909 history of the local Presbyterian Synod.